This romantic bedroom is created by using Proposal (AF-260) on the walls and Frostine (AF-5) on the woodwork. Today we thought we'd use Valentine's Day as an excuse to inspire you to look at reds and pinks in a fresh new way for your home. Reds and pinks are too often reserved for girls' bedrooms - but these two colours are surprisingly versatile - from sweet and pretty to bold and sophisticated - and can be the perfect choice for a variety of spaces. In fact, nothing perks up a room like decorating with red or pink, but many are afraid to introduce this powerful colour into their home. Fortunately, there are many creative ways in which you can introduce these shades without feeling overwhelmed. 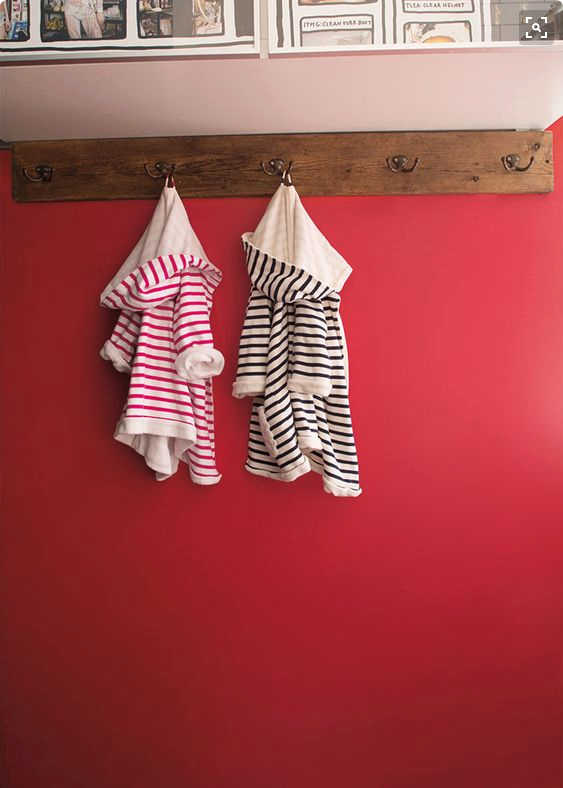 Of course people also shy away from bold reds and pinks because these colours have a reputation as being very difficult colours to decorate with, often needing upwards of 6 coats to cover. Reds also often don't wear well either, being difficult to clean without leaving a mark. 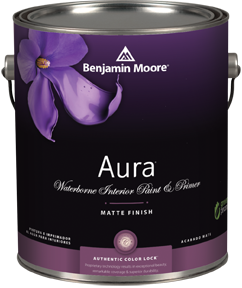 The good news is that, with Benjamin Moore Aura, you can be sure that it will always cover in two and can be cleaned without marking, for a stunningly beautiful and long lasting finish. 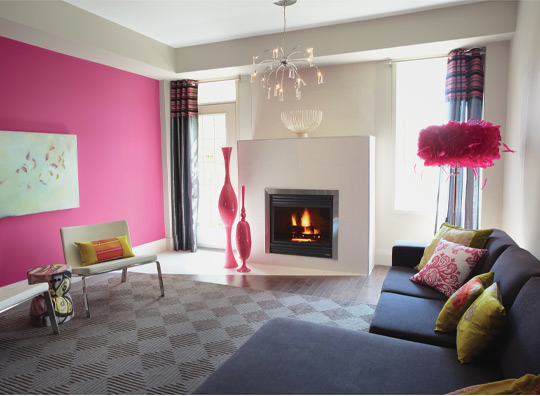 Use strong reds and pinks to create a sense of fun and draw the eye to dramatic features. 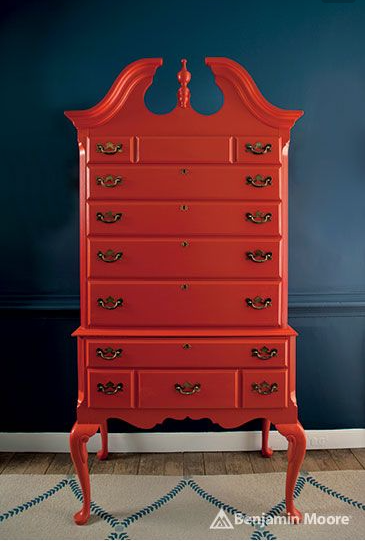 The bold Cornwallis Red (CW-315) makes this chest of drawers a real focal point against the Washington Blue (CW-630) walls. Raspberry Mousse (2076-40) is used with layered neutrals Fog Mist (OC-31) and White Heron (OC-57) and dramatic hot pink accessories. An up-beat and youthful living room is created with Sultan's Palace (2081-20) on the walls, Baby Fawn (OC-15) on the ceiling and bookcase, and Cloud White (OC-130) on the woodwork. 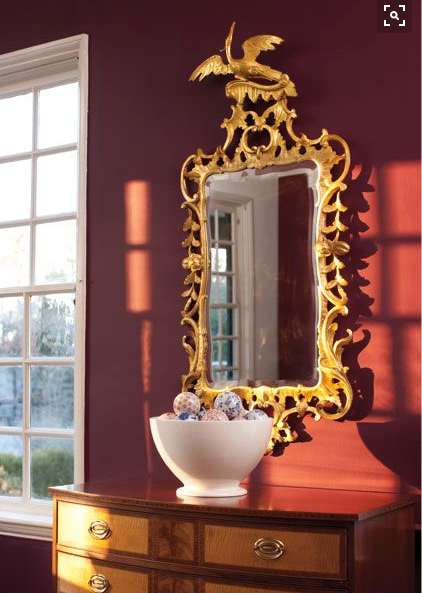 Carter Plum (CW-355) provides the perfect backdrop for rich metallic statement pieces. The splash of vibrant Watermelon Red (2087-70) creates a sense of fun in this hallway. 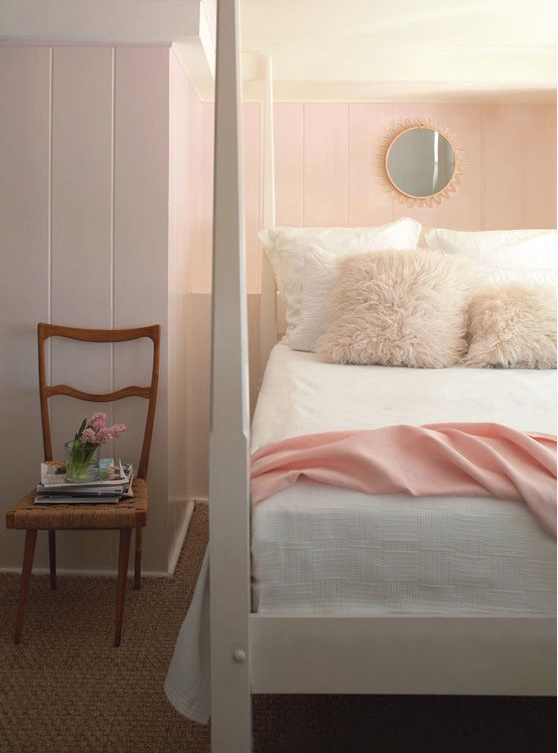 Gentle and layered pinks can create a romantic and timeless look. 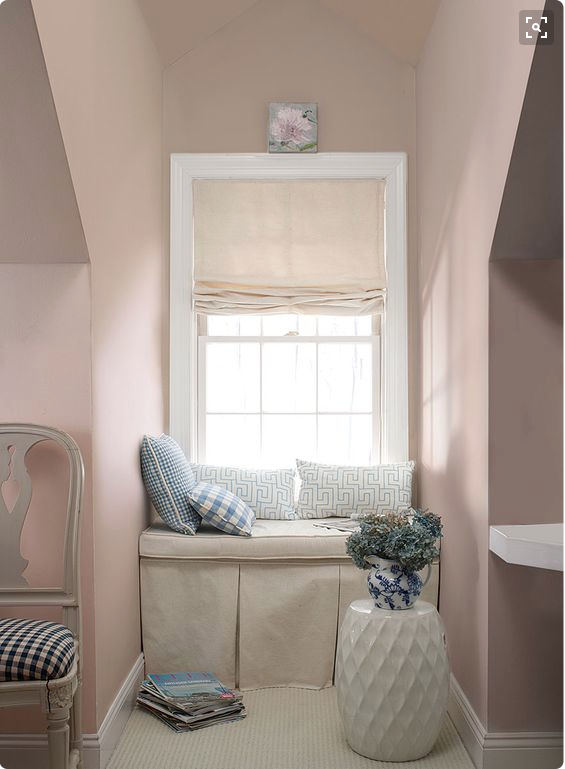 This fabulous window seat uses Raleigh Peach (CW-205) and neutral and blue accessories. This sophisticated statement bathroom uses Fruit Shake (2088-60) on the walls and White Heron (OC-57) on the ceiling. 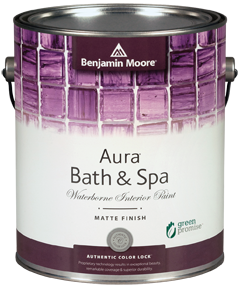 This bathroom pairs soft hues in Aura Bath and Spa Matte finishes with monochromatic fixtures. Pink Damask (OC-72) is used on the walls and Chantilly Lace (OC-65) on the ceiling. A romantic dressing table area layers Touch of Pink (2008-70) above the dado and Sunlit Coral (2170-60) below to create a pretty, grown up space. This stylish living room uses Bridal Pink (2013-70) on the walls and ceiling, punctuated with White Opulence (OC-69) on the woodwork. 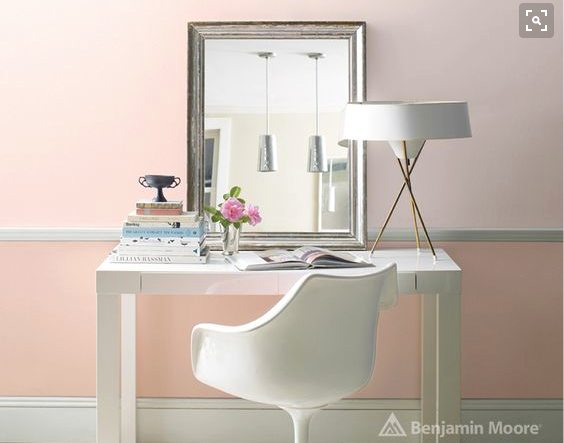 For stunningly beautiful reds and pinks, choose Benjamin Moore Aura.